To be conscious is to be aware, and when we are aware of the words we speak everyday (both out loud and in our own heads) we start to realize what we are really saying. Over the years I have studied the energy of words and their impact on the human body, mind, and soul, as well as their affect on the perceived reality that surrounds us. I create coloring books with a personal message, otherwise known as art with intention. All of my coloring books are hand-drawn with love and intention (and a zentangle-inspired twist) to inspire change in each and every person. When we improve our individual lives, the lives of all of those around us improve as well. And when we are all doing this, the world changes. Coloring is a meditative and healing process for all and I bring that together with the use of affirmations and positive thinking in order to influence the body, mind, and soul in an uplifting manner. Philosophers and scientists say that it takes between 10 and 30 days to create a new habit and I use art with words in particular to create new, positive, and constructive habits in myself and I wish to share this transforming process with everyone. Words are powerful and, when used with intention, can help us create the life we want to live that is full of love, happiness, and abundance. Affirmations are also known as reminders, because we often forget how amazing, beautiful, and love-filled life can be every now and again. Affirmations assist in re-programming our minds to see the positive in life; for we attract what we think about most and believe at our very core. Use the power of your mind to hack your own thoughts and beliefs by surrounding yourself with the right messages and words to inspire growth, opportunity, abundance, love, respect, and beauty for everything life has to offer. Surround yourself with what you really want out of life and the universe will bring more of those things to you in return. That is the amazing power of the mind and manifestation. More on "Talk To Yourself"
​Words have power. Words form our perceptions and create our realities. When you change the words you use, your life changes as well. Words are important and, when used purposefully, they convey messages to instill constructive mindsets. Now is the time to move beyond believing that you are not worthy enough, not loveable enough, not beautiful enough and not intelligent enough. You are more than enough. We all are. There are 30 unique, one-sided reminders to color. The reminders included are: I am beautiful enough, loved enough, successful enough, smart enough, strong enough, good enough, and many more. We are all more than enough in all aspects of our lives, and when we start to remember this our lives improve on many levels. Use coloring to your advantage by committing to forming a new, uplifting habit while having fun, getting creative, and relaxing to your one of your favorite pastimes. 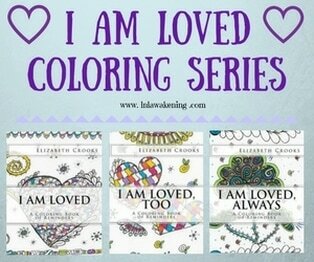 More Info on "I Am Enough"
I wanted to provide the best well-rounded approach to changing a habit with the words and phrases chosen for these coloring books. At the time these books were published, I had spent over two years researching and experimenting with the words and phrases, among others, and these are the top ones I feel they affect the human mind most constructively when wanting to change your thoughts for the better. ​Becoming mindful of my own thoughts, beliefs, and programs has changed my life in many ways. I believe words have energy, and I am more conscious of the energy I surround myself with every day now. Change is a constant force in the universe. We may not get to choose when change happens in our lives, but we do have a choice in how we respond. This coloring book contains 37 unique affirmations to promote a more change-positive lifestyle and mentality. Retrain your brain to become excited about change. As humans we learn and grow from this change, and it is our choices that determine if we see change as positive or negative. More info on "Change is Exciting!" ​This is not your cookie-cutter coloring book. This coloring book contains 50 unique designs worth many hours of zentangled-inspired fun. These designs are random and designed to keep you busy and entertained for days. If coloring is beneficial to your health then this book will help keep you distracted long enough to feel calm and absorbed in a world of coloring bliss. So get distracted in a good way by diving into this coloring book right away! More Info on "Doodle Distractions"
There are 42 unique, one-sided reminders to color. The reminders included are: I am Beautiful, I Enjoy Being Me, I Accept Myself, I am Worthy of Love, Beautiful Inside & Out, and many more. We are all perfect and beautiful just as we are, and when we start to remember this our lives improve on many levels. Use coloring to your advantage by committing to forming a new, uplifting habit while having fun, getting creative, and relaxing to your one of your favorite pastimes. More Info on "I Am Beauty"
There are 42 unique, one-sided reminders to color. We are all inherently worthy in all aspects of our lives, and when we start to remember this our lives improve on many levels. Use coloring to your advantage by committing to forming a new, uplifting habit while having fun, getting creative, and relaxing to your one of your favorite pastimes. More on "I Am Extraordinary"